What are the designs on the Wyoming flag and what do they represent? Who designed the Wyoming flag and when was it adopted? How are you supposed to fly the Wyoming flag and the American flag together? 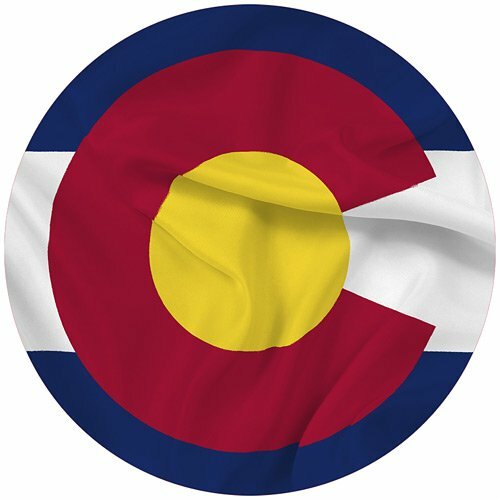 Where can I purchase a Wyoming state flag? The flag of the state of Wyoming consists of a dark blue field bordered by white and red. 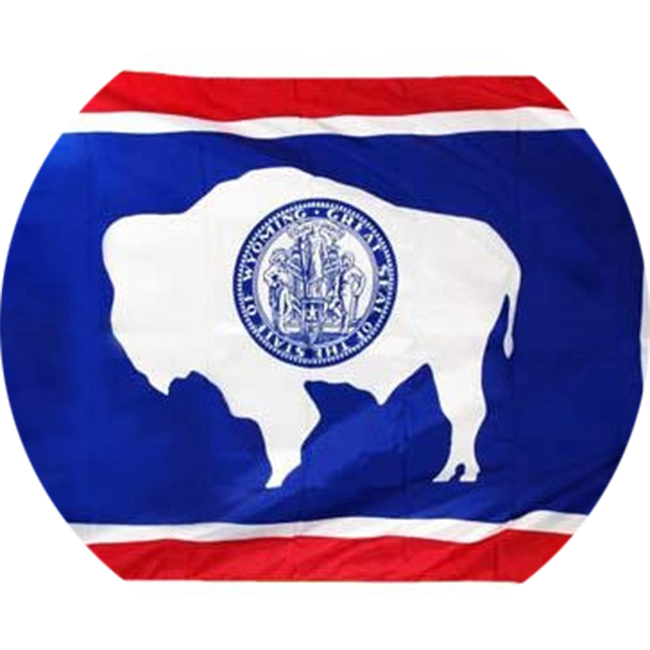 In the center of the flag is an American Bison (buffalo) which bears the state seal. The red symbolizes the Native Americans and the blood of pioneers who gave their lives reclaiming the soil. The white is a symbol of purity and uprightness. The blue is the color of the vast sky and majestic mountains and symbolizes fidelity, justice and virility. The bison represents the local animal group while the seal on it stands for the custom of branding livestock. In the center of the seal is a Greek goddess holding a staff which has a banner containing Wyoming’s motto, “Equal Rights”, which symbolizes the political status women have always enjoyed in Wyoming. The two male figures typify the livestock and mining industries of the state. A bald eagle over a shield and a five-pointed star bearing the number 44 signifies Wyoming as part of the Union, as it was the 44th state admitted to the Union. On top of the pillars are lamps from which burn the Light of Knowledge. Scrolls encircling the two pillars bear the words, Oil, Mines, Livestock, and Grain, which are the four major industries in Wyoming. The two dates, 1869 and 1890 commemorates the organization of the Territorial government and Wyoming’s admission to the Union. Miss Verna Keays of the Wyoming Daughters of the American Revolution was the designer of the Wyoming Flag. 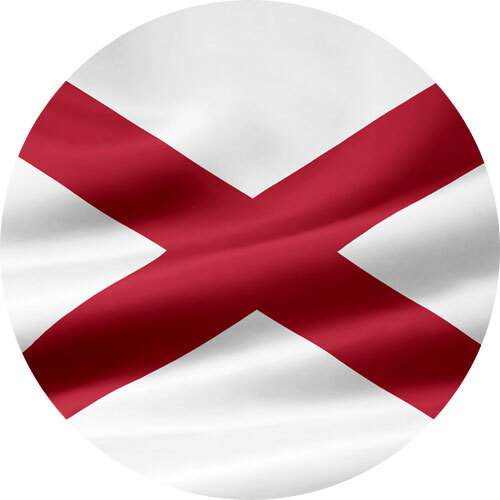 It was officially adopted in January 1917 by Governor Robert D. Carey when he signed the state flag bill into law. 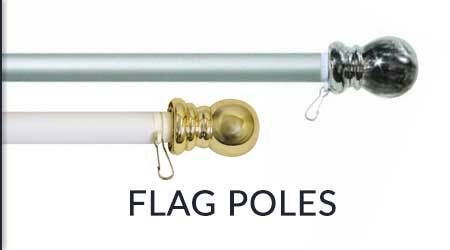 When flying the Wyoming and American flag on the same pole, the flag of the United States must always be at the top and the Wyoming flag should be the same size or smaller. 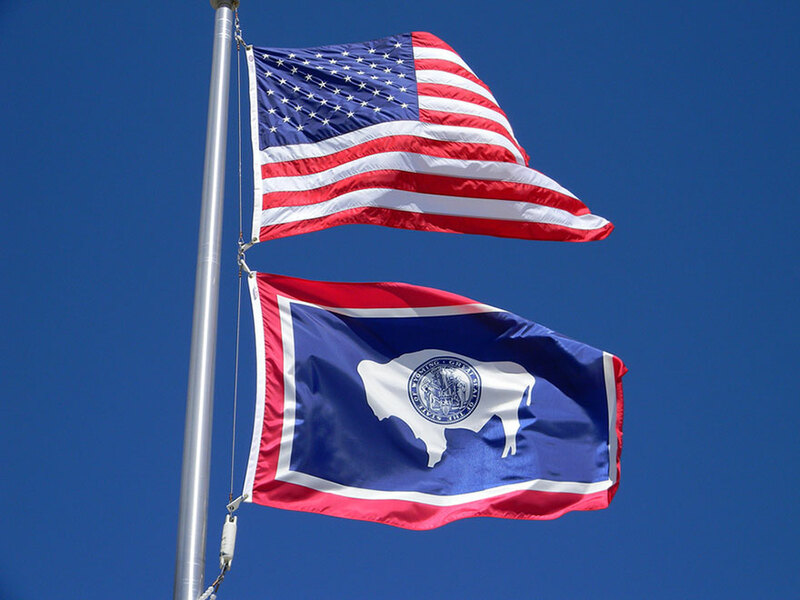 When It is flown on separate poles, the Wyoming flag will be to the right of the flag of the United States situating the U.S. flag in the position of honor, which is to the observer’s left of the other flags. 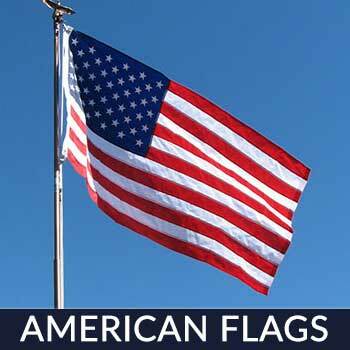 To buy a 100% made in the USA Wyoming flag, then purchase one from Star Spangled Flags. 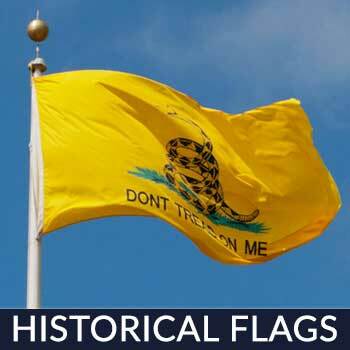 They treat their flags to protect them from sun damage and use a very strong nylon fabric with strong stitching to keep them durable and prevent unraveling and fraying. They also have free shipping in the USA. 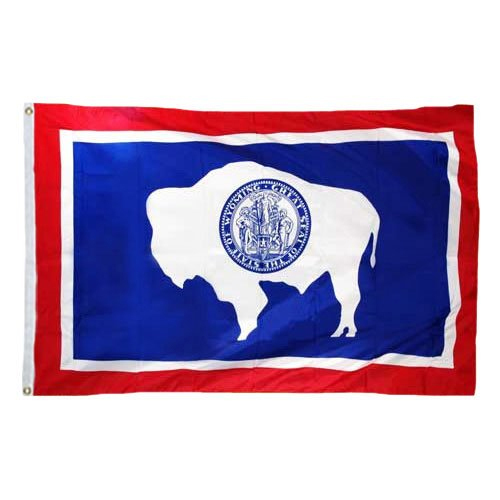 Now Wyoming’s state flag has the silhouette of the American Bison with a red border symbolizing the Native Americans and the pioneers’ blood. The white color on the flag means purity and uprightness while blue being the color of the skies as well as distant mountains. 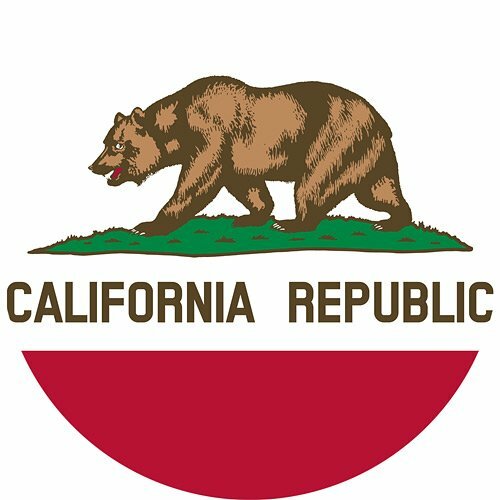 Overall, the flag is a sign of virility, justice, and fidelity with the bison as the local fauna and the seal inside the silhouette means how livestock is branded. 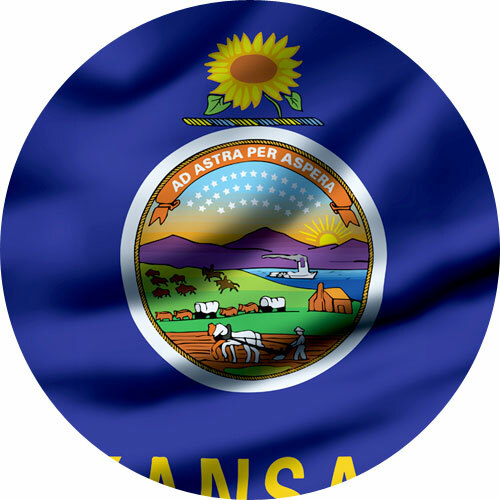 The name of the state comes from “mecheweamiing” Native American for “at the big plains”. It has three interesting nicknames that are: The Equality State, The Cowboy State, and Big Wyoming. 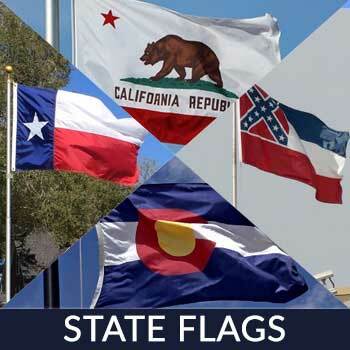 State motto is Equal rights, the Cutthroat Trout is the state fish, Plains Cottonwood being the state tree, Indian Paintbrush is the state flower, the state reptile is the Horned Toad, Jade is the state gem and Western Meadowlark is the state bird. 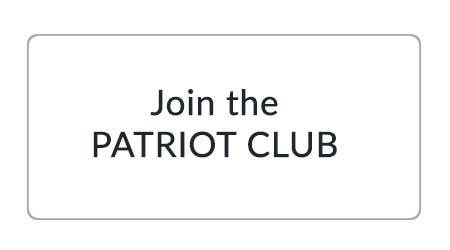 They have 5 national forests, 2 national parks, and 16 state parks. 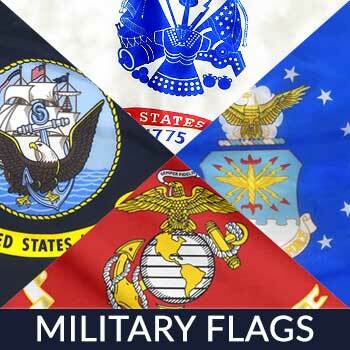 Here at Star Spangled Flags we only use top quality materials in the flags that we make to ensure they last long and that flying them would show one’s patriotism and the huge love for this great nation we call home.